Znaps is a new Kickstarter project that aims to make connecting a Lightning cable to your iPhone or iPad as simple as connecting a MagSafe charger to your MacBook. Znaps consists of a connector that plugs into the Lightning port on your iOS device, and an adapter for your Lightning cable that lets it connect to the port magnetically. With the Znaps Connector and Adapter, a Lightning cable can snap onto your device using magnets, making it quicker to connect and charge an iPad or iPhone. There's also a version for devices that use Micro-USB. Znaps is small enough that it will work with a wide variety of custom iPhone cases that leave the Lightning port exposed, and as the project's creators point out, it can cut down on the hassle of fumbling to get a Lightning cable plugged into an iPhone or an iPad. Znaps works for both charging and syncing, and a small LED light on the adapter will light up when a device is being charged. The magnetic field it uses is "negligibly small" according to the project's creators, and will not cause damage to the internal components of the iPhone. It also does not enhance or impede charging times. 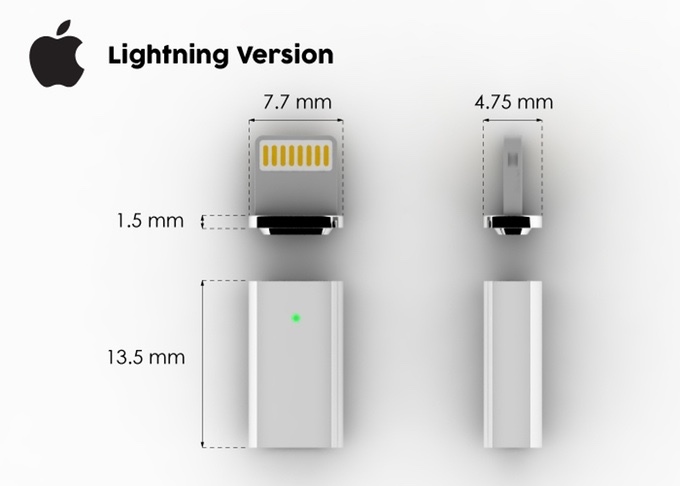 A Znaps Connector and Adapter for Lightning or Micro-USB can be obtained for a pledge of $11 Canadian, or just under $9. There are also several other tiers available at different price points for purchasing multiple Znaps. Znaps are projected to ship in late November of 2015, but as most of us have experienced on Kickstarter, there are projects that miss shipping estimates by months, especially when orders exceed expectations, so prospective purchasers should keep that in mind when backing this project. So many people are going to lose money on this. This clearly infringes on Apple's patents regardless of what their lawyer told them. It's in the FIRST SENTENCE of the patent. An electrical plug and receptacle relying on magnetic force to maintain contact are disclosed." I won't sit here and argue about semantics but Apple has the lawyers and the patent know-how to win this case. Good luck to anyone who backed. What about this patent from Apple? Our patent lawyer did a patent search before we started the project. This is one of the reasons why we didn’t develop ZNAPS into a whole charging cable. We haven’t infringed on Apple's patent. The patent has nothing to do with "cables", but everything to do with "a plug that uses magnets to retain contact while conducting electricity"...which is PRECISELY what this Znaps does. Sounds like their lawyer was Znapping on the job. I'd get a new lawyer if I were them. Someone should back them with 100 million dollars. You know, for legal fees. Takers? Pretty sure this infringes on Apple's patent. I expect this will be shut down pronto. Wow, this is so clever and neat. Would also keep the dust (and water, according to the website) out as well. The best part is that it's at a reasonable price too. This may be the first project I back on Kickstarter. Yeah, this sounds like a case-study of a kickstarter project put together knowing full-well that it will never go anywhere past the introductory video and all that backer money will disappear into someone's pockets. Anyone thinking of backing this, please remember, Kickstarter is not a store and you are not placing an 'order' by backing a project!! Shocked that MacRumors didn't recognize the red flags in this scam right away. It's pretty blatant. They really should update the article with a warning, unless this is an adverticle paid for by Znaps. Patent issues notwithstanding, Znaps hasn't even accounted for the $4 per Lightning connector licensing fee they will be on the hook for, just to be compatible and compliant with the Lightning connector protocol. Each of the two pieces of the "adapter" would be subject to the $4 licensing fee, as they are sold separately. As such, Znaps is selling a product for $9 that will cost them $8 in licensing. Prime example of how these things never are released. Lots of people backed this one too. Now actually you can't just read the summary of a patent and declare any matching design to be infringing, the details matter and the accused product must match in the details too. Apple's patent describes a connector which at one side is connected to the device and at the other is connected to the charger (or other electrical relation). Since this product isn't actually connected to anything they may have some wiggle room. They may very well not have to pay any such fees. Their device doesn't need to interact with the Lightning protocol at all. They can just wire pin-to-pin and the cable or connector wouldn't even know the adapter was there.